I promised this recipe weeks ago, didn’t I? Whoops! I had completely forgotten about it until I started going through pictures. I hope you’ll forgive me! 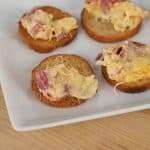 So rueben dip? How weird, right? It’s exactly like the sandwich (and I know you love the sandwich) but in dip form. Seriously, corned beef, sauerkraut, thousand island, Swiss cheese! Does it get any better? I have to tell you that this dip is not pretty. I was pretty appalled when a friend walked into my kitchen as I was mixing up this bright orange mess and tearing up corned beef to throw in! It was so worth my embarrassment though – I had it for breakfast the next morning! Oh yes, that good. I served it with those little toast rounds and some pretzel crisps, both were delicious but the toast rounds were perfect with it! 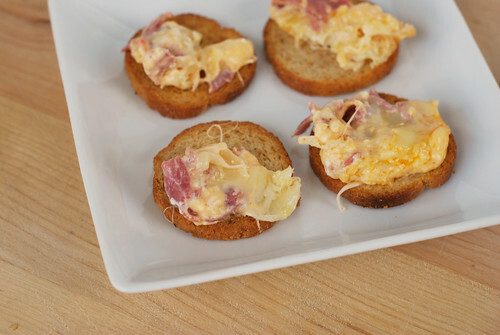 In a large bowl mix together the cream cheese, 1 cup of the Swiss cheese, the dressing and corned beef. Spread in a pie plate or other shallow serving dish. Top with the sauerkraut and the remaining 1/2 cup of Swiss cheese. Bake for about 15 minutes, or until bubbly around the edges. Serve hot. I am baked bean obsessed. To say the least. It’s not uncommon for me to buy a can and then eat them everyday for a week straight. I eat them plain, on roasted sweet potatoes, on toast, pretty much any way you can imagine. But I’ve never made my own until recently. 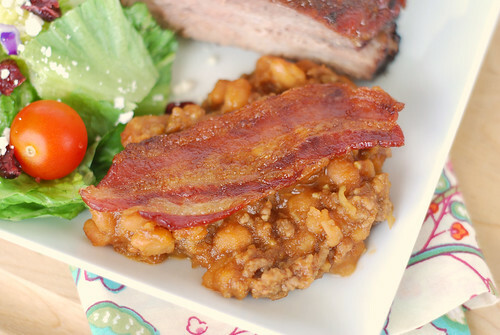 Granted, this recipe starts out with a can of pork & beans but still – I made them, right? 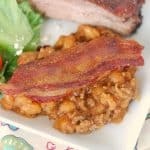 I usually buy the super sweet Bush’s beans with maple syrup so this recipe was quite a change. It’s not sweet at all but it’s so delicious! If you wanted to take this to a large cookout, it’s very easy to double – double everything but the soup mix. Combine ground beef, water, white vinegar, onion soup mix, pork & beans, ketchup, brown sugar, mustard, and garlic. Stir well and pour into an 8 x 8 inch baking dish. 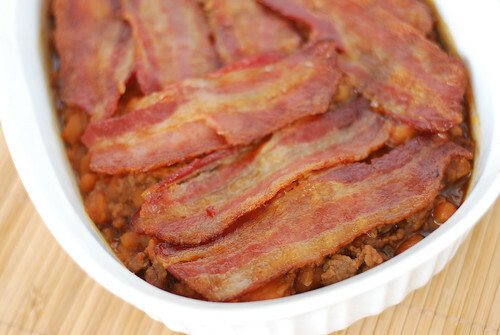 Top with bacon and cover with aluminum foil. Bake, covered, for 30 minutes. Uncover and bake for an additional 15 minutes. If you follow me on Twitter, this is probably old news to you but I thought I would share on the good ol’ blog too. My husband recently came home after being gone since January. I didn’t tell you guys because I’m paranoid cautious, but don’t feel bad because I didn’t even tell my Facebook friends. But like I said: old news. The best thing about having him home is that I have a reason to cook things besides pasta and eggs! I’m taking full advantage of that and kicked off this week with something I’ve been wanting to try forever. 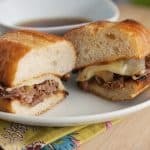 The French dip! 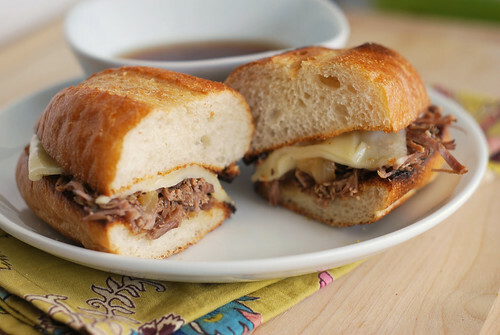 So this sandwich, which I don’t think I’ve ever had before, is just beef that’s slow cooked in a flavorful broth (or jus, if you’re fancy) and then put on crusty bread with cheese. Then you get the dip the entire sandwich in the broth that you cooked the beef in! Fantastic does not describe how good these are! We had these for an early dinner and then a few hours later when my husband went to workout, I snuck into the kitchen to have another. Then when he came home, I caught him in the kitchen having another one! This is a definite keeper and I see myself making it frequently once winter hits. Slice the onion into ~1/4-inch rounds. Keeping the rounds intact, place them in the bottom of the slow cooker. Add beef broth, soy sauce, Worcestershire sauce, mustard, and garlic to the slow cooker. Salt and pepper both sides of the roast and place on top of the onions. Cook on low 6-7 hours until beef is fall-apart tender. Transfer the roast to a cutting board and shred using two forks. Remove the onions and set aside. Use a spoon (or fancy instrument if you have one) to remove the fat from the broth. Return the roast, juice, and onions to the slow cooker for up to an hour before serving. Heat the broiler. 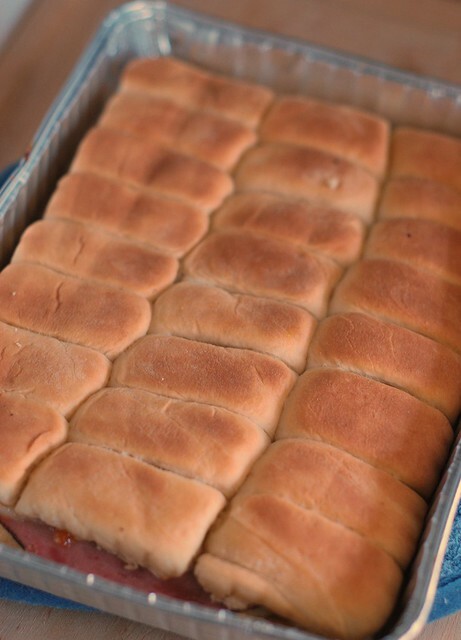 Place the split sandwich rolls on a lined baking sheet and toast for 1 minute or just until the bread begins to brown. Remove the tops from the pan. Scoop the beef onto the bottom of the rolls and top with cheese. Return to the oven just until cheese is melted. Top with sandwich halves and serve with small bowls of jus. Lately it seems like the only meat that goes on (decent) sale is ground beef, which isn’t something I like to buy or cook often. Ground beef just bores me. Burgers and spaghetti – that’s all I make with it. 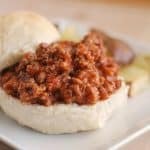 I’ve been trying to branch out and these sloppy joes ended up being a terrific way to use a pound of beef. 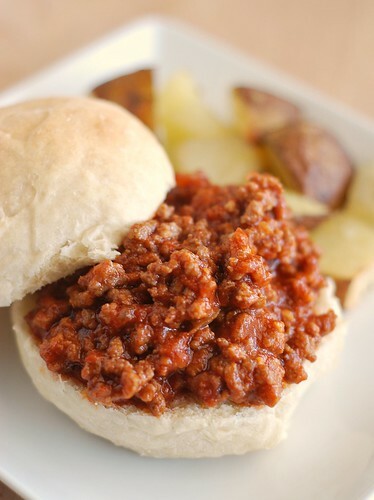 I cannot tell you the last time I had sloppy joe mix from a can so I sadly cannot compare this recipe to that but I can tell you that this is very good. 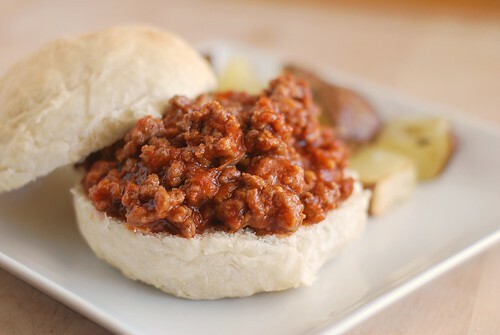 It’s sweet but not too sweet, it’s a little spicy, and it’s messy just like a good sloppy joe should be. When I first found the recipe, I thought the amount of tomato products would be overwhelming but by the end it hardly tasted like a tomato sauce. If you’re looking to sneak extra veggies into your diet, dice up some carrots, bell pepper, or mushrooms and saute them with the onions. In a large skillet, heat the oil to medium-high. Add onion and salt, lower heat to medium, and sautÃ© until the onion is soft and translucent, about 5 minutes. Add garlic and chili powder, and cook for about 30 seconds. In the meantime, grab a medium bowl, and combine the tomato sauce, water, brown sugar, red wine vinegar, Worcestershire sauce, honey mustard and red pepper flakes. Add the tomato mixture to the beef. Stir in the tomato paste. Simmer for at least 10 minutes, or until the mixture reaches your desired consistency. Happy Saturday! I hope yours is off to a better start than mine! I have had the worst headache for over a week now and finally made it to the doctor yesterday only to be told that it’s a migraine and there’s not really much I can do but wait it out. I thought about skipping a blog post today but decided I owed it to you guys to share this one in case there’s anyone out there looking for a last minute party idea. 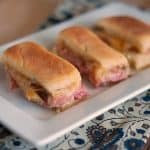 These hot sandwiches are so good and so easy! My mom made them about a year ago for my grandparents 50th (!) anniversary party and she’s made it once since then because everyone loved it. Well, months ago I promised my husband that I would make them for the first NFL game of the season so that’s exactly what they did. And we loved them again! These guys are baked right before serving so the Havarti, which is already ridiculously creamy, gets all melty and delicious. The peach jam and the roast beef are a match made in sweet-and-salty heaven. The flavors all work together somehow and turn into the most delicious sandwich ever! My mom says she’s also done ham, swiss, and strawberry jam sandwiches that turned out wonderful so if you aren’t big on beef, try that. I know my picture is less than stellar, but they really are great. My husband is already asking when I’m making them again! Remove rolls from packages. (Do not separate rolls.) Cut rolls in half horizontally, creating 1 top and 1 bottom per package. Spread preserves on cut sides of top of rolls; sprinkle with pecans. 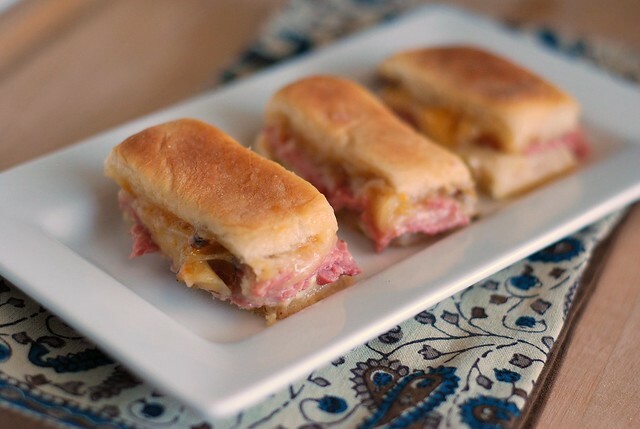 Spread mustard-mayonnaise blend on cut sides of bottom of rolls; top with roast beef and cheese. Sprinkle with salt and pepper, if desired. Cover with top halves of rolls, preserves sides down, and wrap in aluminum foil. 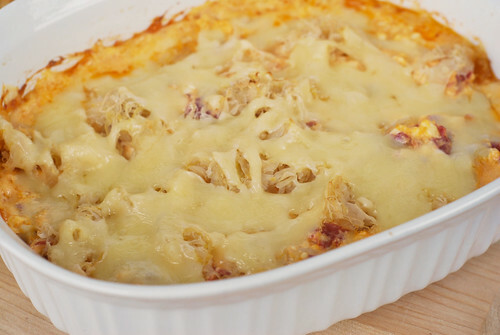 Bake for 30 minutes or until cheese is melted. Slice into individual sandwiches. Serve immediately.